When the A23 was widened one of the pylons was due to be demolished, but due to the public outcry (what a great word) the road was built to avoid it. The original road just ran between the two pylons and there was a big earth bank between the road and the railway. This spoil was the waste dug out of the railway tunnel in Victorian times. I think the soil was used to help build the new road. The Pylons were indeed intended to be a welcome to Brighton to the traveller approaching the city from the north along the A23. They were originally either side of the single track road. When the A23 was widened into the present dual carriageway, not only was there an outcry that either of the Pylons be demolished but, as the Land Agent and Surveyor acting for the Brighton Council’s Farmlands Estate at the time, I kept back from the compulsory purchase order made by the Department of Transport an area of land upon which a third Pylon could be constructed to to the west of the new carriageway to match the other two, and thus preserve the symmetry. Needless to say, the Council would not consider such a cost at that time, and certainly the Department (quite properly) would not entertain the idea of providing a third pylon as part of any compensation receivable by the Council. Thus Brighton and Hove should still possess this small area of land, set aside for future use should anyone like to raise the money for such a project, subject no doubt to planning consent, etc. being obtained. Herbert Carden was a great benefactor to the Council, and 80 years on (2008) might be a suitable date by which to commemorate not only him, but also the fact Brighton and Hove is now a City. Perhaps the Argus might like to run a campaign and get together another time capsule. Anyone like to take up the challenge? Wonderful! My husband’s grandfather Herbert Valentine Campbell had something to do with the building of these. He was a Ornamental Plasterer. I am the Great grand son of Sir Herbert Carden, and I agree that what a splendid and fitting tribute it would be to build the third pylon. In memory of Sir Herbert who would have been so proud to see his town become a city. His family have lived in the the town since at least 1615 (14 generations to date). My daughter is the great great grand daughter of Sir Herbert and I agree entirely with Tim that there should be something to show the city’s respect for such a man. Mmmm… the same Sir Herbert who wanted to clear most of Kings Road and to demolish the Pavilion for re-development? Merely provoking discussion. Neither my husband or I are Brightonians but have adopted the town (sorry – city!) as our home for nearly 20 years. Our daughter was born here and ever since she could speak has always cried ‘Brighton Pillows!’ as we drive in from a trip away. We didn’t know the provenance of the Brighton Pillars (or Brighton Pillows, as they will forever be referred to in our house) but they will always symbolise coming home to us. 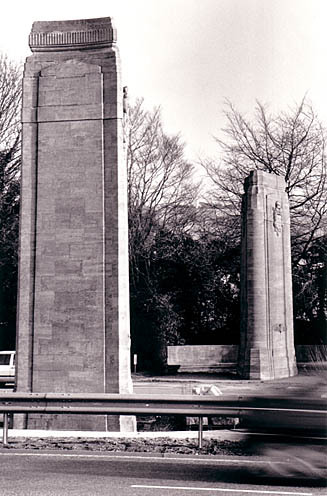 In researching the date of the pylons I note that they were designed by John Denman. However, I believe it was a collaboration with Louis Ginnett [the Ditchling artist]. Information is available on this artist at Ditchling Museum. I have lived in Brighton all of my life and as a small child whenever my Mum and Dad, Nan and I had been on a day out, as we drove through the pylons on the A23 on our way home, we always chanted ‘out of Brighton, out of Brighton, out of Brighton and ………… into Brighton’. I believe that the Pylons were built by local builders Field & Cox (no longer in business). We also felt that we were home when we came through them. Did anyone else think that it was going to a short drive when they saw the sign “Wales and the West pointing towards the Henfield road at the Blue Star Garage on London Road? Nigel’s research is interesting as Louis Ginnett was married to Sir Herbert’s sister Lillian. There is a book in the Brighton library entitled Carden of Brighton with full info and family tree and other interesting facts, ie he was instrumental in the formation of Brighton’s trams, securings acres on downland for the town, the building of Moulescombe. Does anyone remember the little tea bar where one could pull over and have a quick cuppa? It was about 250 yards south of the Brighton Pylons, if my memory serves me. I seem to remember a RAC patrolman with his motorbike and sidecar standing there saluting members cars displaying the coveted RAC badge. Correct me if I’m wrong but was there a connection to the Southdown bus company ie. a bus stop perhaps? I think that somedays you can still see the brick wall of the cafe but be careful if you are driving. Next point of interest farther south again still on A23 the Robin Hood garage where two of my mates did their apprenticeships. Jarp likes the Brighton Stones very much. Thank you. To answer Gerald’s point re the tea room. My grandfather ran the truck stop cafe where you say. He ran it for a long long time up to his death in about 1957. The family (my dad included) lived in a council owned house behind the cafe with a great big verandah going round the back and sides. My dad who recently passed away spent the most wonderful childhood with his back garden as the South Downs. The house was called Zopenia and was demolished after my grandad died, my nan was then rehoused in one of the old flint cottages in Patcham by the Black Lion (or is it the Black Horse?). The statement by Edwin Macadam (23/1/2006) regarding the pylons being a welcome to the traveller approaching Brighton rang a bell with me. I think roughly about 1963 about one o’clock in the morning I was riding my Triumph motorbike from London to my home in Brighton. It was a really dirty night coming down the A23. Just after the pub at Pycombe the bike cut out, water having gotten into the electrics somewhere. I was mad at the time because it was hurling it down and windy to boot, just right for a breakdown. I did not have any breakdown cover at all. I wasn’t boy scout orientated at that time so did not have a torch with me, probably only the inevitable plug spanner and maybe a screwdriver wrapped up in a bit of rag. I pushed the bike toward Brighton with the intention of pushing it all the way home. When I came across the pylons I got behind the southbound one where there was no wind. I left the bike for a bit hoping that it being hot would dry out. After about an hour fumbling in the dark I tried again but it would not spark at all. So I thought sod it and I laid down beside the bike and went to sleep even though I was freezing cold. Being the summer daylight came pretty early. I was lucky really, it had stopped raining and the sun was shining and warm. My tongue was like a bit of dried sacking when I woke up. Anyway I tried again and the bike started after a couple of bouts on the kick start. I was a bit dubious in the beginning but it ran fine. So on I got on and went off home. All the way I was looking forward to a slab of fried bread and egg and bacon and a mug of tea and a good long kip. I am always boy scout minded now, and I am a firm believer in sod’s law. I don’t know about ‘Hail guest,…. etc’ – the pylons have a distinctly Neuremberg design feel about them, so perhaps ‘Heil’ would be more fitting? They cleaned them with a sandblaster or that type of machine in the 90’s, after that you couldn’t read the text from a distance that clearly. Glad I know what it says now and who built them, as they are at the bottom of my drive. The best places for a picture of them visiting the stones is on the Brighton museum web site and there used to be a clip on British Pathe not sure if it is still on there. I have a photo of the pylons taken by my father in 1933 when he was on tour with the Clacton Cycle Club. In the foreground is a square white brick building on the side of the road. I expected it to be an RAC hut but it has a sign over the top reading “ST JOHNS AMBULANCE” with their Maltese Cross in the middle. If you go to YouTube, you can call up the newsreel of the then Duke of York at the event in the late 1930s. Do any of you knowledgable types know what date that section of the new A23 was completed? I know work was going on during the ’80s but when was it all completed? There was supposedly a promise at that point to invest in a third pylon.